The Beatles Song of the Day is Golden Slumbers. 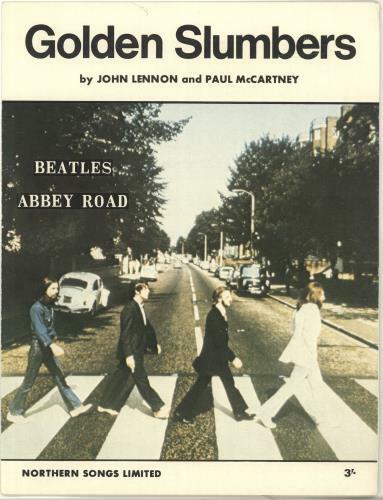 Golden Slumbers was written by Paul McCartney and is part of the medley of songs on side 2 of Abbey Road. Golden Slumbers and the following song in the medley- Carry That Weight were conceived and recorded as one piece. Paul was at his fathers home in Cheshire that summer when he picked up a song book belonging to his step-sister Ruth-unable to read music he made the verse on his own.The original version was written by Thomas Dekker a contemporary of Bill Shakespeare. Paul McCartney: double-tracked vocal, chorus vocal, piano, rhythm guitar: George Harrison: chorus vocal, bass, lead guitar: John Lennon: chorus vocal: Ringo Starr: chorus vocal, drums: Produced by George Martin. rating of Golden Slumbers as part of the medley of songs ***** stars out of 5 stars. Golden Slumbers was never released as a single. Recorded on July 2,3, 4, 30, 31. August 15, 1969. Spignesi and Lewis in their book rank the medley of songs-#36. Rolling Stone # 23, critic Bill Wyman 22-29, The Beatles Listeners Poll #4 and Jim Beviglia gives the Golden Slumbers/Carry That Weight/ The End #3.